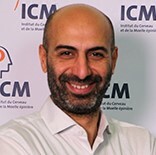 Bassem Hassan joined the ICM in January 2016 where is leader of “Brain development” team. He received a Ph.D. in Molecular Genetics at The Ohio State University in 1996 before going for a post-doctoral training at Baylor College of Medicine in Houston, Texas. From 2001 to 2015, he was a Senior Group Leader at the VIB Institute’s Center for the Biology of Disease and Professor at the Center for Human Genetics at the University of Leuven School of Medicine, in Belgium. In 2003 he received the EMBO Young Investigator award and in 2009 he was elected EMBO member. In 2015 Bassem Hassan was named Einstein Visiting Fellow for the years 2016-2018 at the Free University of Berlin and the NeuroCure cluster. Development and differentiation of the Nervous System, genetics, molecular and cell biology and computational approaches.